Aribert Reimann – now in his 80ies – is one of the most important and prominent contemporary German composers. Since composition of his opera Lear (first performed with grand success at Munich State Opera in 1978), he considered the creation of another stage work based on one of the huge mythological characters of world literature, Medea. But it's only when discovering the Austrian writer Grillparzer’s adaptation (first performed in 1821) that the subject “…haunted (him) and (he) couldn’t escape the duty of composing another feature-length operatic work…”. Medea’s world premiere was then staged 2010 at the Vienna State Opera. 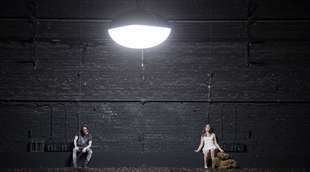 The Berlin premiere was now produced by Komische Oper as part of a programmatic, broader Reimann Series in Berlin, including the world premiere of the composer’s newest opera creation L’invisible at the Deutsche Oper Berlin later this year. In today’s context (maybe a little different form the time of its creation before 2010) Medea’s fate looks fundamentally relevant in light of the refugee crisis and all its implications on integration, or rather its opposite, e g dangerous potential for disintegration, rejection of foreigners, separation, building of walls in real life or in our minds. The internationally renowned director Benedict Andrews, whose professional biography reads like an extreme example of a global theatre worker, regularly engaged in a variety of undertakings from London via Germany to Sydney, recently even adding international film productions to his scope of activities, headed the production team. In a rather dark, almost completely empty stage with not much more than a few stones, tons of mulch all over stage and a very basic structure of fragile strings suggesting an unfinished house’s structure at the ramp, stage designer Johannes Schütz creates a space of utter loneliness and hopelessness. A huge lamp exemplifying an outsized and aggressive sun revolving and finalizing a complete circle over the development of the drama does not contribute to any release from the prevailing desolation. The production team is completed by Victoria Behr, responsible for the likewise reductionist costumes. In the first part of the evening, Andrews shows like an experimental set-up with Medea and whoever is part of a scene in the foreground as all others sitting in the rear like expecting his or her moment of interaction in the arrangement. At the end of part one and in the second part of the evening, climax and crisis of the drama culminate in extreme and grandiose singing and acting of Nicole Chevalier’s Medea. The singers wholehearted stage performance and the control of the extremely demanding soprano part make her the event of the evening. Günter Papendell personifies the opportunistic character of Jason perfectly. Medea’s confidante Gora is adequately cast by Nadine Weissmann and Jason new crush Kreusa is performed by the likewise brilliant Anna Bernacka. Her father Kreon is in best hands with Ivan Tursic. A particular impressing stage appearance with an outstanding vocal performance gave the countertenor Eric Jurenas as Herold. It’s truly remarkable that Komische Oper Berlin is able to cast all roles exclusively out of the own company ensemble – a tremendous proof of the theater’s capacity. The difficult orchestra part was under the baton of Steven Sloane, an experienced conductor of many skills, well renowned chief conductor of the Bochumer Symphoniker since 1994 and highly praised for his work with young musicians. He guided the Orchestra of Komische Oper Berlin through all the intricate score and like extremely volatile musical structure of the complex work. The orchestra played highly engaged with wonderful and brilliantly performed solo parts of quite many instrument groups all over the evening. Obviously, contemporary opera is still no simple treat leaving quite a number of seats empty after the intermission. The audience applauded long and heartedly, many bravi for Nicole Chevalier, Günter Papendell and Steven Sloane in particular. Tremendous applause also for the clearly delighted composer who took his bows alongside all performers and the production team.